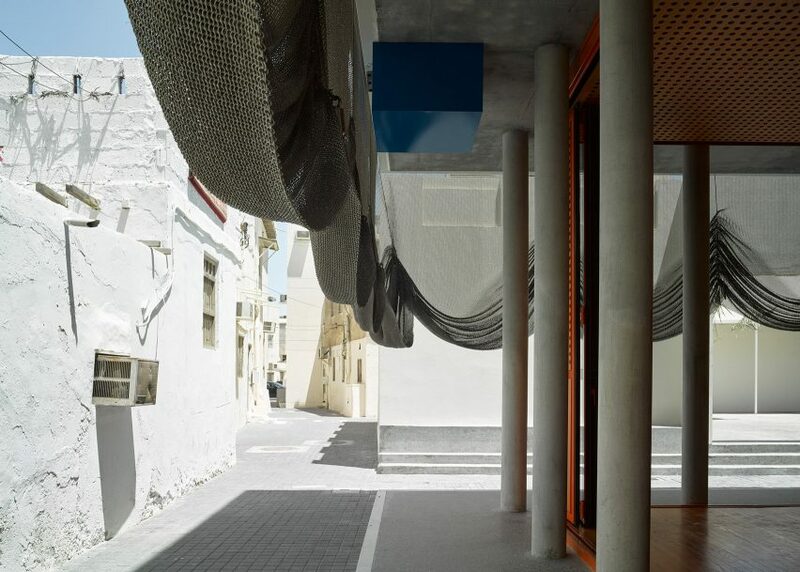 Steel mesh curtains can be lifted to offer glimpses of performances inside this traditional music centre designed by Office Kersten Geers David Van Severen for Muharraq Island in Bahrain. Brussels-based Office Kersten Geers David Van Severen was tasked to design a pair of cultural centres for Bahrain – an archipelago of 33 low-lying islands in the Arabian Gulf – as part of the country's urban regeneration. Called Dar Al Jinaa and Dar Al Riffa, the buildings are located in Muharraq. The old town was formerly the centre of Bahrain's pearl fishing and is now known for its traditional music and arts. The architects chose a similar style to complete the two centres, which included renovating an existing house, known as Dar, and adding a community space. This space, which the architects liken to a Majlis, will host traditional music performances. As shown in Dar Al Jinaa, the first centre to be completed, the structure is made up of concrete columns topped with overhanging platforms that are draped in steel mesh. The veil completely covers the building, which rises three storeys high and narrows towards the top, providing shade for the glazed walls behind during the hot desert weather. It is gathered up into rouches at the bottom to notify when performances are taking place on the ground floor. "When the building is in use, the veil is lifted to allow passers-by a glimpse of the performances inside." Hinged wooden frames surround the glazing to allow the space to fold open to the street at the front or the courtyard at the rear. Perforated wooden shutters are fitted behind to offer privacy and darkness when necessary. The architects set the stairs, toilets and technical necessities in boxes on the outside platform level to keep the main space as open as possible. An office and a smaller music room are located on the floors above. Office Kersten Geers David Van Severen was founded in 2002 by architects Kersten Geers and David Van Severen. The firm recently completed a ring-shaped residence threading between trees in a Spanish forest as the second Solo House, a series of dream holiday homes designed by leading architects for French developer Christian Bourdais.